Nordic Conqueror Dagger with Sheath | BUDK.com - Knives & Swords At The Lowest Prices! Complete your ancient weapon collection with this beautiful dagger! This replica Nordic dress dagger measures 14" overall and features a two-toned stainless steel double edged blade. The intricately detailed cast metal handle offers ornate artwork and gold-colored highlights. 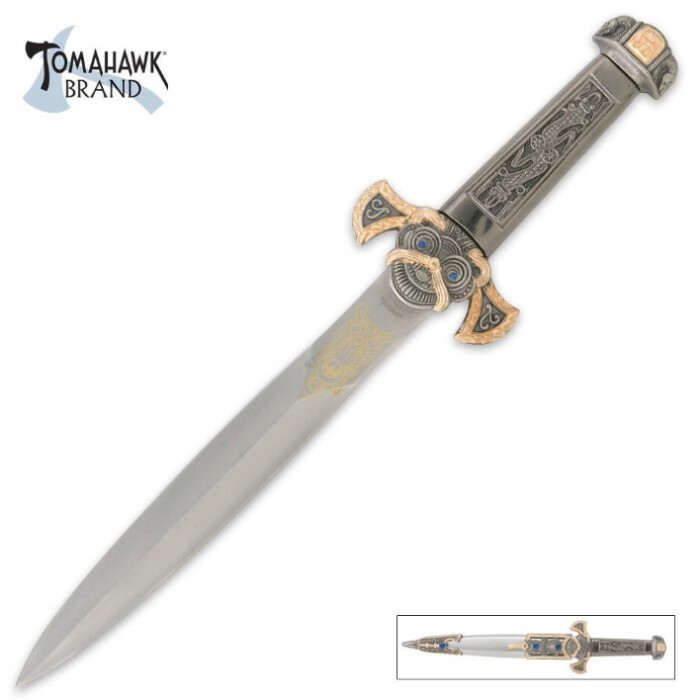 This dagger includes a composite sheath with blue faux jewel accents. Okay, so it was a little smaller than I had hoped. I bought this for a Viking knife, then I get it in the mail and it says it's a hunting knife, then I look at my receipt, and it says it's a Roman emperor's dagger. To me it still looks Norse. The knife itself is, as usual, not too sharp, good quality, beautiful craftsmanship. As the other reviewer pointed out one of my blue stones fell off too. Unfortunately I was not able to find it. Overall a great accessory to your medieval costume, or knife collection. A must buy. I bought the last one that was in stock awhile back. Good to see it is back. Excellent workmanship, good weight and heft to it, and the blade is even sharp! One of the better buys here at BUDK. Looks great on the wall, and will enhance any collection. Thanks BUDK for bringing it back! This dagger is great! I have to say I wasn't impressed much by tomahawk but this dagger is wonderful! Well built, good quality, and wonderful price are the best words to describe it. The steel is strong good, quality and has a sharp edge. The sheath is metal and looks great with the dagger in it. The price can't be beat and overall this is a very good buy.